Congratulations to Leah Wasson, one of our sixth year students who was awarded her Silver Gaisce Award. As well as applying herself to her Leaving Cert. studies, Leah took on the challenge of the Silver Presidents Award. 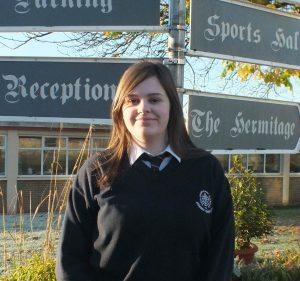 While in TY Leah achieved the Bronze Gaisce Award and decided to go ahead and work towards the next award – silver. To qualify for this she had to invest considerable time into community work, developing a personal skill and taking on a new physical activity. Finally she had to go on an expedition or adventure. For her community involvement Leah volunteered in the Faith and Light shop in Wine St., Sligo. Her physical activity was swimming while she learnt crochet as her new personal skill. To finish off the award Leah went on a camping and walking adventure in Donegal. The award took a lot of effort and commitment, not to mention a lot of her personal time. It was worth it, though, she says, and she hopes to go for the gold award in the future. WHAT IS GAISCE, THE PRESIDENT’S AWARD? The President’s Award, Gaisce, is a National programme designed to encourage students to push their boundaries out and gather experience in areas they would not otherwise explore. There are three levels of achievement, starting at Bronze and working through Silver to Gold. Every year Sligo Grammar School TY students opt to go for the Bronze award and sometimes students in 5th year go on to claim their Silver award. This year, as usual, many TY students signed up for the Presidents Award. They have to complete 1 hour a week in Personal, Physical and Community activities for a total of 13 weeks for 2 of the sections and 26 weeks for 1 of your choice. They then have to complete an adventure trip. Achieving this award demands commitment on the part of the student, but in return the student is rewarded with a great sense of achievement and community spirit. there are also health and creative benefits as the students take up a new activity and develop new skills. Examples of community involvement might be working with people with special needs, training younger sports teams or working with community groups to make the area a better one to live in. The Personal and Physical components might encompass things like taking up a new sport or activity in one of the many local clubs – the list is endless, and learning a skill be it cooking, playing music or gardening. If they wish students can continue to work for the Silver Award in 5th or 6th year. Students who participate in the Silver Presidents Award need to put in twice the amount of effort as they did with their Bronze Award if they wish to succeed .